International Students reading certain government-subsidised programmes can apply for the Service Obligation (SO) Scheme to pay reduced, subsidised tuition fees. International Students who have applied successfully for the Scheme will be required to undertake a service bond under the terms of the Service Obligation to work for a Singapore-based company for three years upon completion of their degrees (i.e. the employment secured after the date of degree conferment) so as to discharge some of their obligations to the Singapore public for the high subsidy to their graduate education. Singapore-based companies refer to local and international companies that have a base in Singapore that is registered with the Accounting & Corporate Regulatory Authority (ACRA) as well as companies of such local and international companies registered with ACRA that are based overseas. Please refer to MOE's website for more details. Student has not already attained a graduate degree that is of the same or higher level than the one s/he is intending to pursue through MOE subsidies or sponsorship by the Singapore Government agency (such as scholarships offered by the Ministries, Public Service Commission and Statutory Boards). 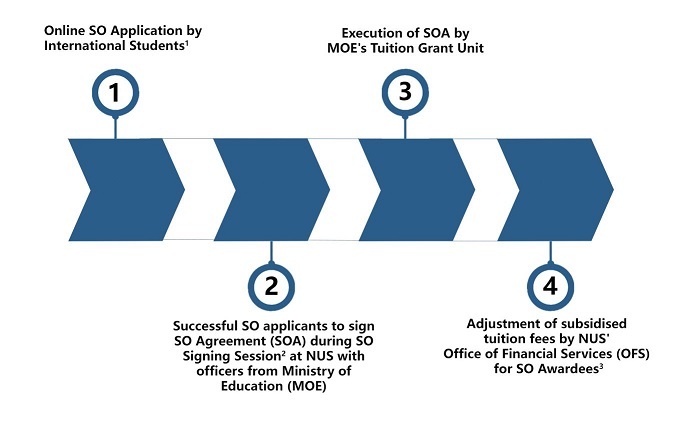 Student who has received MOE subsidies or sponsorship by the Singapore Government at the Autonomous Universities for the previous programme(s) at the graduate level for which s/he did not complete will be eligible for MOE subsidy up to the maximum course duration for the new programme less the equivalent number of semesters of government subsidy/sponsorship received for the previous programme(s) of the same level. Students in self-funded graduate programmes are not eligible for the SO Scheme. The list of self-funded graduate coursework programmes is set out here. The terms and conditions for students on NUS RS, PGF and TFA who have already signed Service Obligation Agreement in previous semesters remain unchanged. As the first semester's tuition fee will be billed before the Service Obligation Agreement is executed, students are to ensure that they have sufficient funds to pay the tuition fee amount chargeable before Service Obligation subsidy. After successful execution of the Service Obligation Agreement, the tuition fee will be adjusted accordingly. The difference in tuition fee paid will be credited to the students' Student Account in myEduRec and used to offset the next semester's tuition fees. For students who wish to have a refund of the Credit Balance (arising from the Service Obligation Agreement executed) in their Student Account, please write-in directly to the Office of Financial Services (Attention: Ms Tay Hui Koon at ofnthk@nus.edu.sg). While submitting the online SO application, please ensure that Home Country and Singapore addresses are filled up completely under “Addresses” section for the applicant and both sureties as shown in page 7 of the MOE TGOnline System Guide. Closed for lunch break from 12.30pm to 1.30pm. Students are strongly advised to attend abovementioned Signing Sessions to complete SO signing formalities. For students with Sureties in Singapore, queue numbers will be only issued when both sureties are present at the venue. Any requests for advance queue number will not be entertained. Queue numbers for the morning session will be given out from 9.30am to 11.00am and afternoon session from 1.30pm to 3.00pm. Student and his/her two sureties are required to be present to sign the Service Obligation Agreement (SOA) in the presence of MOE officer. Student is required to login to his/her account and download the Service Obligation Agreement (SOA) from the MOE TGOnline System (under the "Portfolio" tab). Student will need to either email a softcopy of the SOA (sureties will need to print it) or courier the hardcopy SOA to his/her sureties who are overseas. Sureties are required to sign on the SOA in the presence of the Notary Public, Commissioner of Oath or a practicing lawyer. The witnessing party is also required to sign on the SOA. Student must bring the duly completed and endorsed original SOA to sign in the presence of MOE officer. Newly admitted and current International Students who meet SO eligibility criteria provided above. SO applicants who successfully submitted online SO application during the application period can attend SO Signing Session to complete SO signing formalities. Only SO applicants who completed the signing formalities can enjoy subsidised Tuition Fees from the current semester to the end of their candidature.